Tariffs continue to harm US producers. A strong US dollar is acting as a significant headwind to US exports. World grain supplies are near record levels. While some commodities rebounded nicely in 2018, the grain markets have continued to stagnate and even decline into Q1 of 2019. Trade wars, a strong dollar, and unrelenting world supply have continued to pressure corn, soybeans, and wheat prices across the globe. Further evidence of stress levels in the grains sector can be seen below in Bloomberg’s ag sub index. 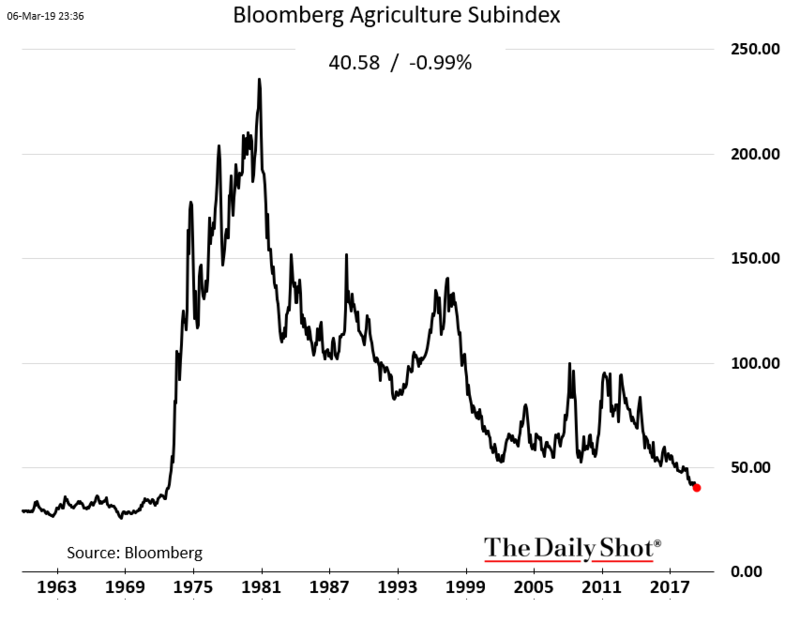 As you can see, inflation-adjusted agriculture prices are at levels not seen since the late 1960s. 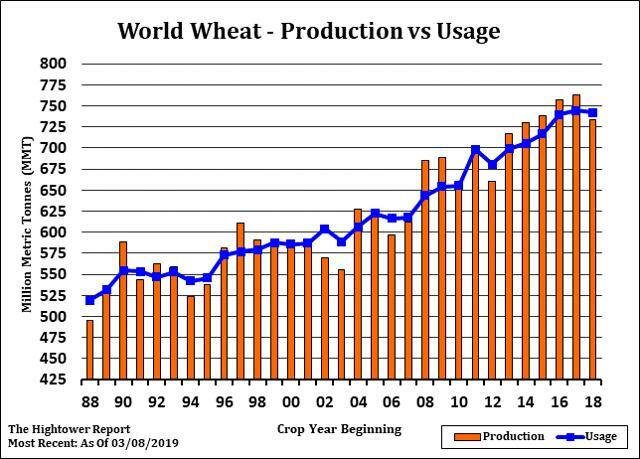 This begs the question: is now a buying opportunity or will the grain sector be in decline for years to come? Notoriously harmful to America’s agriculture economy, trade wars have failed to ever significantly benefit the US ag sector, mainly due to the fact that ag exports are what directly come into the line of fire during negotiations. The most recent dispute with China is no different, with soybeans in particular being centered in the crosshairs of trade war negotiations. You can see below that once the US initiated steel and aluminum tariffs last spring, the response by the Chinese on soybeans was significant. The cost of soybeans FOB to China increased nearly $3 in just few short months following the implementation of tariffs! Furthermore, the US farmer went from a $1.50 price advantage to over a $1 price disadvantage following the tariff retaliation by China. While this trend may revert to the mean over the longer term, the bigger question and concern is how many Chinese customers have been permanently lost to Brazil? 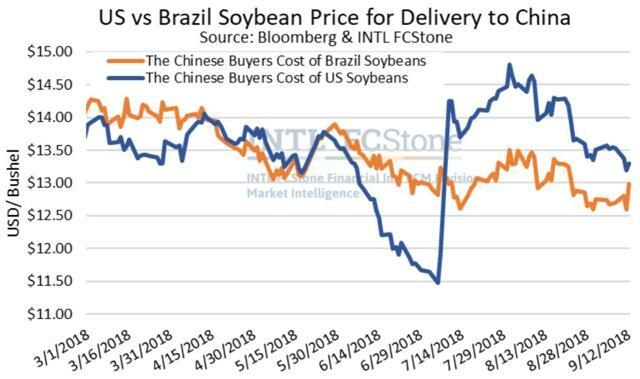 Furthermore, the longer this trade war persists, the more likely it is Chinese buyers find permanent suppliers in Brazil, thus permanently eroding US demand for soybeans. With QE coming to an end and interest rate hikes beginning, the US dollar has been seen significant appreciation in the last few years. This appreciation has been swift not only because of central banking policy, but also because of the US economy’s strength compared to other countries across the globe. While being an excellent deterrent for inflation, the strong dollar has made US grain products much less competitive on the world market. 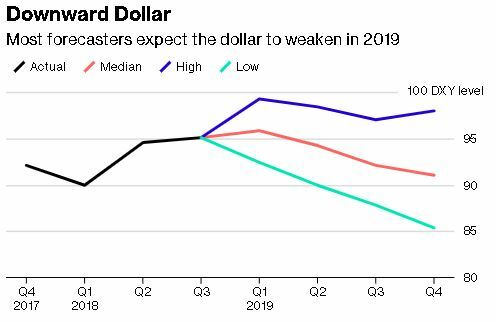 Fortunately, many predictions for 2019 are for the dollar to either stabilize or depreciate slightly. A decline of even 5% in the US dollar would help stabilize grain prices, and a drop below that could generate some additional demand from buyers outside the US. The depreciation of the dollar in 2019 should be one catalyst that works in favor of the ag sector, and particularly grains. 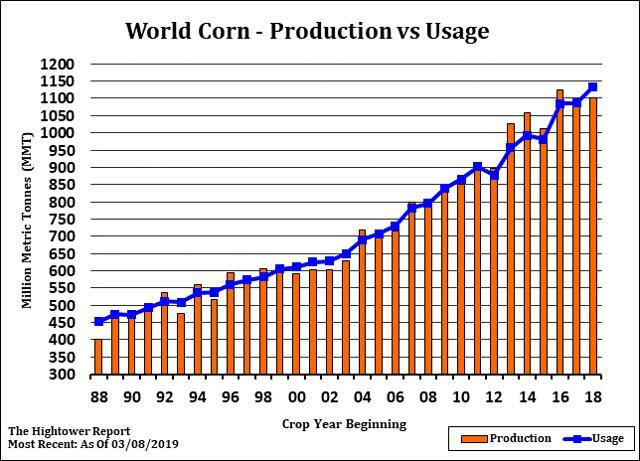 What is quite interesting is that corn and wheat production in 2018 fell significantly short of demand. If these trends continue, price appreciation will have to occur in order to balance the market. I cannot stress enough: the US has had ideal growing conditions since 2012. Grains are much like oil or natural gas in the sense that the supply/demand chart is very inelastic. Prices will dramatically change if the supply/demand balance is off even slightly. Consumers and refiners of grains will pay whatever price is required to fill their own demands/contracts. Without question, the current headwinds for the US grain markets are significant. 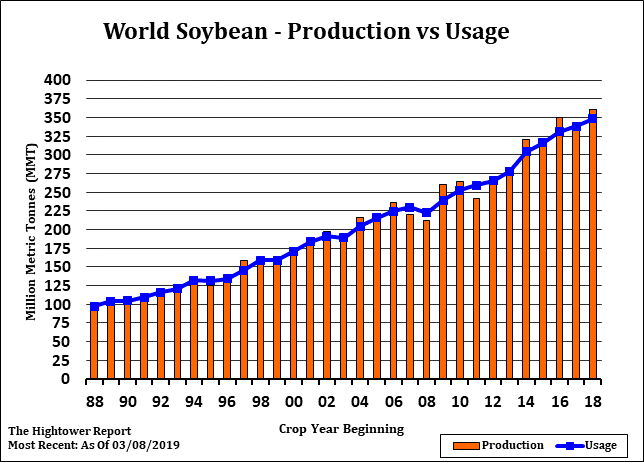 However, if the trade war is resolved, the dollar stabilizes, and world demand continues to outpace production, price appreciation will occur for corn, soybeans, and wheat. Commodity markets are cyclical by nature, and buying at the bottom always feels difficult. Supporting companies that may also play into this macro trend long-term include Deere (DE), CF Industries (CF), Monsanto (MON), and Caterpillar (CAT). A decade ago, the ag space was booming; today, individuals and companies are going bankrupt. Now is the time to take a look at this space and begin putting money to work for the future.